Pipa Bella is your ultimate fashion jewelry destination in India and South East Asia, selling necklaces, earrings, bracelets, rings, personalized charms, and metallic tattoos. Our products are on-trend, affordable, with an utmost focus on quality. Prior to OnlineSales.ai, Pipa Bella had experimented managing campaigns manually and with other partners, failing to achieve goals, and that simultaneously exposed them to unintelligent risks like: spray and pray methods, excessive burn of ad spend, lack of transparency in methods etc. 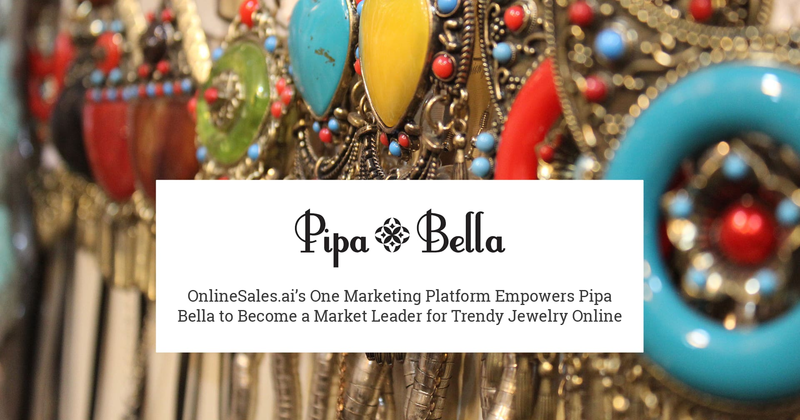 Pipa Bella onboarded on OnlineSales.ai’s One Marketing Platform with a single-minded agenda: they wished to scale and grow efficiently within limited budgets – a typical problem for every growing eCommerce player in the market today. OnlineSales.ai’s OMP started optimizing on a cross-channel strategy – Google Search, PLA, Remarketing, Facebook Ads, DPA, and Instagram Ads. Ad spend were increased month-on-month while maintaining high-AOV transactions, at 40% reduced CPLs. This led to 2X growth within a few short months. OnlineSales.ai’s platform discovered every product’s metadata including inventory,price, margins, variations, popularity etc., all real-time. This ensured amazing relevancy in promoting each Product SKU at scale, while acquiring new audiences on a daily basis. OnlineSales.ai’s platform went beyond traditional metrics like CPCs and CTRs, optimizing for what matters most – a combination of New Buyers, Transactions and Margins. OnlineSales.ai’s One Marketing Platform met the business goals and optimized them automatically across channels, accomplishing every action at speed and scale. "We effectively leveraged OnlineSales.ai’s One Marketing Platform to meet our goal of growing new acquisitions and repeat buyers with limited investments, while maintaining a high AOV. OnlineSales.ai has already over-delivered on our goals, something we have not witnessed while working with other partner agencies."